Despite early reservations and lots of general waffle, Twitter does turn up some gems. 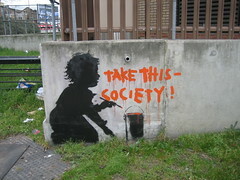 From wry comments on the US political collection to tip-offs about the latest Banksy sightings. The latest batch hot off the street come from New Orleans taken by jonnodotcom. Compare the pic on the left I snapped at Holland Park roundabout in West London, compared to his latest offerings from the Big Easy. Just me or does the tragedy that happened there make those images that much more poignant. My favourite is "No Loitering", what’s yours?